Innovation can be so many things Ugh, can’t we just make a plain text email? Ooh! Let’s make a shopping cart in email. Innovation doesn’t always mean complicated technology usage. Innovation doesn’t always mean complicated technology usage. It should be built around an idea or a new way to tell your story. Just because you can... Ask yourself if interactive strategies: ❑ ❑ ❑ ❑ ❑ Provides value to the user Supports a business goal Is supported on a good percentage of your subscriber’s email clients. Provides an opportunity to learn more about your subscribers Means more than impressing your #EmailGeek friends If you can’t answer yes to any of the above, it’s time to re-evaluate. Process Tips + Tricks ▪ Create a prototype to ensure the technology is supported. ▪ Ensure fallbacks in other clients using a QA software (like Email on Acid or Litmus). ▪ Live test various devices on different operating systems. ▪ If you are unsure of how successful the strategy will be, A/B test. ▪ Never be afraid to ask for help! Add to Cart: Nest Bring shopping cart to the consumer Option to select products, quantity, and style within the email before proceeding to checkout. Provide an opportunity for re-engagement If the user adds products to cart but decides not to purchase, there is now an opportunity to trigger a follow-up Abandon Cart email. Hover Experience: TOMS Shoes Show, not tell the user about features User can hover over the switch to show how the shoes can glow. Large email client support The toggle works on hover in desktop and web clients, and reverts to click on mobile. Content Strategy: Uber Simple technology, strong narrative Content personalized to the behaviors of their users. Uses live text, not an image Text is accessible by screen readers as well as provides the option to highlight text to read full copy. Clever Animation: Kylie Cosmetics Widely supported image format Animated GIFs are supported in about 94% of email clients Easy to implement Provides the ability to showcase products not possible in static designs. 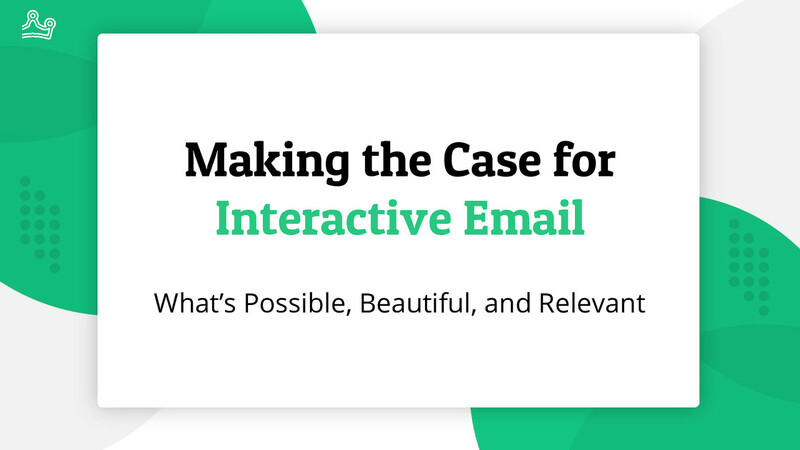 View Making the Case for Interactive Email: What's Possible, Beautiful, and Relevant on Notist. As an agency working with large consumer-facing brands like Taco Bell and Aramark, eROI is often pushing the creative envelope in our email campaigns. To support creative innovation in the inbox we rely on data to make smart choices that help us reach our clients goals to deliver an engaging and hyper personalized message that speaks to all our subscribers. In this session Senior Digital Strategist Cher Fuller and Senior Developer Heidi Olsen will discuss what constitutes innovation and why your clients and internal team should care.